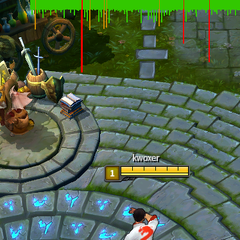 LoL Ping Checker - now showing in-game - das kwoxt! 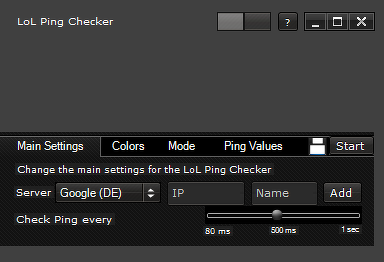 The LoL Ping Checker is released in version 2 now. This brings some changes with it. Overall these are design/usability changes and most of all the possibility to use the LPC in-game now and for sure a better performance/lower CPU usage. For further information and the downloads please visit the LPC website. For those of you that don't know the LPC, it's a smart tool to visualize the ping delays to a server. So basically this is an alternative to "ping google.com -t". But in contrast you will not see just the value, you are able to see it in a kind of coordinate system. This is way better to see the actual state without even reading the value. That's great while playing in-game. As already said the new version is ready to be used in-game. 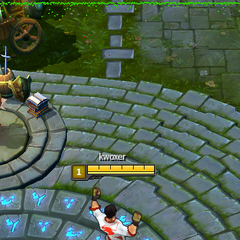 As in the following pictures you can see that LPC supports 2 different visual modes for the pings. Each has its advantages. The first one is showing pixel values. This is minimizing the impact but offering all needed information. The second is showing some lines till the value is reached. Don't worry my friend. When you click on it in-game the focus will be set back to League! In order to use LPC you will need to set the Windowed Mode to Borderless. And of course thanks to Crow for his awesome testing.